Welcome back! We hope that you had a wonderful April break. This year a few classrooms in grades K and 1 have implemented a social curriculum entitled Mutt-i-grees as part of a study. The emphasis of this program is to build social skills, especially empathy and resilience by using therapy animals. As a result, recently Woodstock Elementary School has seen a new face around the office. 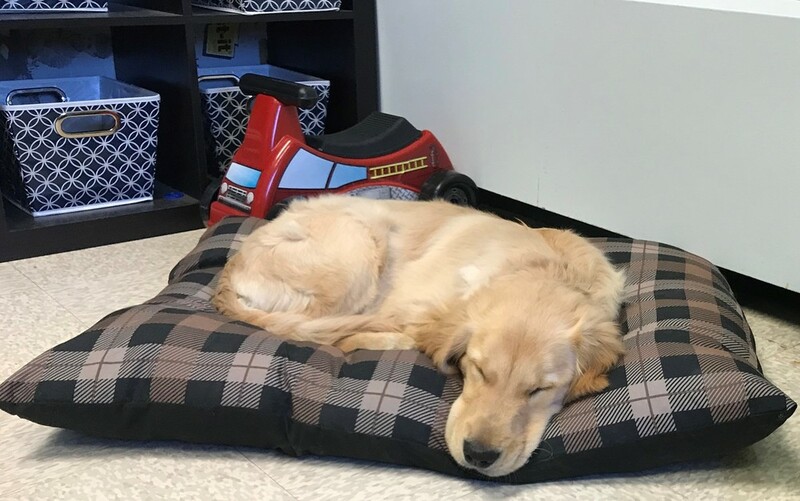 We have acquired a four and a half month old golden retriever puppy named Champ, who is in training to become a certified therapy dog and is our family pet. Champ was acquired through a local breeder and underwent temperament and characteristic testing to ensure that he would be suitable for a school environment and to interact with children. Champ spends his time in the office and a courtyard for exercise, but may be seen walking to the exit out the backside of the lobby or walking around the perimeter of the parking lot. Student interaction is very limited at this point, but in the future we would like that to change, as there are numerous research studies that support the use of therapy dogs in the school environment. Many students may be excited to have a dog in school, but many may be hesitant, afraid, or have allergies. Please be assured that no student is obligated in any way to interact with Champ and students will always be encouraged to wash their hands after petting him. We currently have an air purifier located in the office and Champ is brushed daily and wiped down with a pet cloth to reduce dander, but students with severe allergies may need different accommodations. If your child has allergies, or you do not wish to have your child interact with Champ for any reason, please don’t hesitate to contact me. We want to ensure that this is a positive experience for everyone at Woodstock Elementary. Champ has already been a positive influence to many of our parents, staff and students. We look forward to enhancing the social and emotional learning of our school community as well as offering a comfort animal to all students. Thank you for your support.